I have learned that orphans in my closet don't get worn or since I make separates more than anything, is that the garment that gets more wear, ie mostly pants, I like to have at least 3 tops that go with it. You have much more formal needs than I do but while you make separate pieces your wardrobe says that you like matching pieces not mix and match pieces. You treat separates like a dress,in other words, take 3 pieces out of the closet and wear them together. It's hard to tell in the pictures (every computer is different), but the jacket (orphan one) looks a little on the grey or blue side, and wondering if that's why it's not worn that much..you look like your skin is more ruddy and warm colors would be better.....but I may be off, cause like I say, every computer does colors differently. Wish there was a place we could all point to - a color chart - that was the same on every computer. But alas, I wish I could eat ice cream every day too! I love this post and tour through a couple of your faves. The vintage suit is wonderful and powerful. Wow, you have sewn some very beautiful and chic outfits. The hits are hitting high! I like the pre-blog photos. You sew amazingly and I love seeing your finely tailored work. Very interesting! I think you should continue; you might stumble onto the secret that makes a garment successful! Or, at least, you might discover the 'certain-to-fail' traits! Yes please, would love to see some more. I wear a similar wardrobe and love seeing the jackets. I remember those above and love them all. I'd love to see some more of your pre-blog items :) I adore your work - you sew beautifully. I would love to see more! Fascinating to see what works for you and what doesn't. Is it the warmer grays and shorter lengths that you prefer? I The top two jackets also seem a bit more feminine. Ms Kay, I would love to see more of your creations. All the jackets here are gorgeous, the first is my favourite. 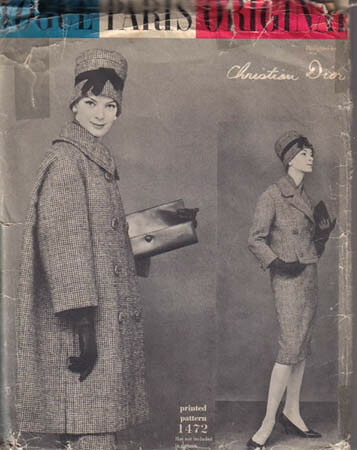 I tried to find the Claire Shaeffer pattern after seeing it in one of her books, I think it may be discontinued now. Do you plan on making it again in another fabric? Yes, please, more, more! 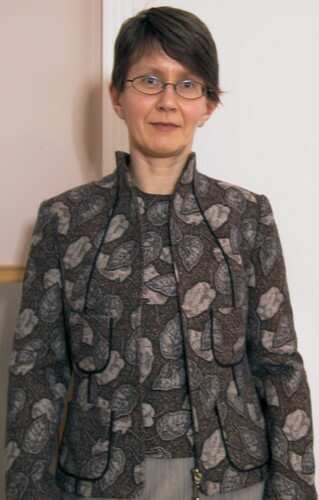 I aspire to making a jacket with padstitching some day, and when that day comes I will return to your photos I'm sure. Until then, please do share more! Yes! to more "antique" photos. Themes: I hear a call for quality in every dimension; they all have it, for certain. Problems: a need for some wearing comfort; the long jacket lacks a little In this regard. Next, perhaps you have a liking for details that make a statement on their own, without embellishment? 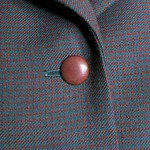 In contrast, to me the long jacket asks to be a canvas for a glorious accessory, such as an art brooch. It looks fab with the orange silk top! Buttoned, a little more stark. Lastly, I wonder if the long one suffers from one of those subtle suit style changes that always defeat me? DH and I are always mystified by this issue in menswear, as well. I can't get enough of your sewing! I long to have the patience to do as good a job as you do. I'm always in a hurry to be finished rather than basking in the glow of the creativity. Yes, please, more of it all from you! As I've said before, you wear it all well. Such a figure you have! This is a fun game! I think part of the reason the last jacket doesn't get worn much is the length. Jackets have been shorter for many seasons now and hip length can feel a bit dated. I think that's part of what is subconsciously throwing you off. I like the lines of it and the fit is great. Maybe swap out the brown buttons for blue? Keep it in the closet, longer jackets will come back eventually!